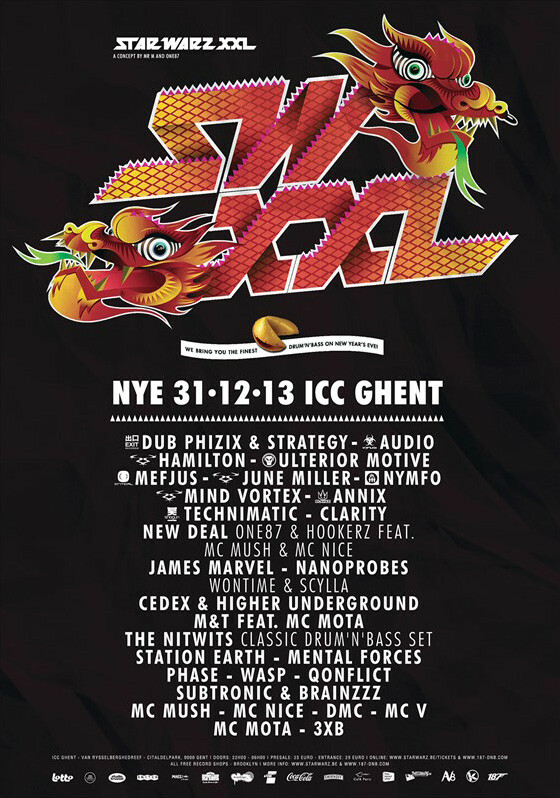 This New Years Eve, Star Warz presents an outrageous XXL edition @ ICC with a diverse line-up containing all kinds of Drum ‘n’ Bass in two rooms, stacked with big international names and outstanding Belgian talents! You can expect two rooms completely filled with bassheadz having the time of their life to the best sounds around. Two rooms that will explode with every new mix and rhyme, time after time. One thing is for sure, if you are a Drum ‘n’ Bass fan and you miss out on this one, you’ll be more than sorry. Check out the amazing list of talent who will bring their fattest and freshest dub-plates for your pleasure all night long! Start the year off with a bang, start it @ Star Warz XXL! Room 1 will explode to the sounds of Dub Phizix and Strategy. Dub Phizix has tracks out on all the most respected labels in the world as Exit, Soul:R, Metalheadz and many more. Their track ‘Marka’ with the vocals of Strategy is one of the biggest Drum ‘n’ Bass hits ever and since then they have been travelling the world together. Further ammunition will be provided by Audio who released his debut album on Virus Recordings and has been banging out records on numerous labels since, as well as Hamilton who is now signed exclusively to Andy C’s RAM records. More fire will come from Ulterior Motive who are preparing their debut album on Metalheadz as we speak after best-selling singles for Subtitles and Commercial Suicide in 2012. We hope you can handle the heath because our next artist, Annix’s debut album ‘Inception’ has been regarded as one of the most anticipated underground releases of the year. The last international guests in this room are Technimatic consisting of Technicolour & Komatic who were already doing great solo but are now doing amazingly as a duo with releases on Critical and Viper recordings. The Belgian delegation in this room is lead by a brand new sound-system in the form of New Deal consisting of One87 and Hookerz, joined by both MC Mush and MC Nice. Quadruple power in one act, they are sure to knock you off your feet. They will get the company of Cedex & Underground, Meddik and Toxedelic – now also known as M&T, Phase and Wasp as well as three outstanding MC’s: DMC from Holland, Steams MC Mush and MC Mota of Rampage fame. And if you thought that Room 2 would be less impressive, think again because this room will definitely not be less powerful than the first. Mefjus is a new serious threat to emerge from the Austrian Drum ‘n’ Bass scene. His furious productions and collaborations speak for themselves and can be found in most of the neurofunk mixes out there. Next up is June Miller who immediately caught the attention of Loxy, who signed them to his timeless Cylon label. This was followed by signings from forward-thinking labels such as Horizons, Deep Soul Music, Renegade Hardware and InnerActive. Twice voted ‘Best Dutch DJ’ in the past few years, Amsterdam-based Nymfo may be no newcomer to Drum ‘n’ Bass but has recently established himself amongst its most promising production talents notably with his debut album 'Characters' on Commercial Suicide. Last international super talent here is Mind Vortex who are an integral part of RAM Records and the Ram events, you can’t get much bigger than that! That we also have a lot great talent in our own backyard proves James Marvel with his releases on Ammunition Records. And also Wontime & Scylla will seriously attack your system as the Nanoprobes while The Nitwits will catapult you back in time with a classic Drum ‘n’ Bass set. And the party isn’t over yet because also Station Earth, Qonflict and Subtronic and Brainz are planning assaults on your dancing shoes. Our own Mental Forces will even team up with Clarity from the UK for even more power. On top of that, all artists in this room will be enforced by again three leading MC’s: MC V, MC Nice & Tripple B on the mic to hype you up! So, hold on tight, because this party will set you and this New Year on serious fire right from the very start!